McGregor Lake Vacation Rental #11734 LakeHouseVacations.com Rent Me! Beautiful big blue skies, clean air, crystal clear lake water, - natural spring feed lake 20 feet from deck, and breath taking views of the mountains. Lots of wildlife (deer, birds, frogs in side frog pond, moose and elk) in the yard. Lots of hummingbirds! Quiet & solitude when you want it to be. Call us today at 406-858-2422 or email us for more information, reviews, references and availability! Enjoy breath taking big sky sunsets from the 1,700 square foot deck just 20' from the shore of alpine pure McGregor Lake. This 5 bedroom 3 bathroom guest ranch retreat has everything to make your vacation a truly memorable experience. McGregor Lake is one of the finest lake trout fishing lakes in Montana. McGregor Lake is spring fed and its pristine alpine-lake-quality waters are what companies bottle and sell as pure spring waters. If you like the water there is boating, canoeing, kayaking, swimming, water skiing, jet skiing, fishing, catching cray fish, sun bathing on the dock, dangling your feet in the water or just floating around on an inner tube. There is also hiking, 4 wheeling, mountain biking, off road travel and horse back riding in the nearby Kootenai National Forest. For the more sedate or just wanting to unwind, the in-deck hot tub is the place to start, a casual walk to observe and photograph the local wildlife, a good book on the deck swing or by the waterfall or just sit on a bench and ponder the mountains across the Lake. You can also use the guest ranch as a base camp for all that Northwest Montana and the Flathead Valley have to offer. This place has it all. Large private dock(child or pet gates on front deck), 2 screened in porch areas, boat ramp on site, handicapped friendly, wet bar in bedroom suite, outdoor fir pit Screened porch area on lower and upper levels. Oversized deck with hot tub, swing lounger, outdoor bar area and plenty of seating for watching sunsets. Outdoor dog kennel, large & extra large indoor dog kennels available if necessary. Three kayaks, canoe, aluminum boat, two paddle boats, snorkeling equipment, water floats, selected sizes of life preservers, BBQs, crawdad traps and firewood available for use for registered guests only at no additional charge. High chair, playpen, stroller and kiddie pools available. Some medical equipment available for elderly. Guests have commented that pictures posted online do not do the home justice. Spectacular view & exceptionally clean and maintained. Multi week discount may be available. Sky diving, fishing , boating, horse back riding, off road dirt biking/ four wheeling, walking, bicycle riding. All water sports equipment available at no extra charge to guests. Hot Tub - clean & excellent condition. Rates based on time of year. Return guest discount available. Payment: Personal or cashier check. 100% due at booking. Pet Fee & Pet Security Fee - Pets must be approved in advance. Reservation confirmed upon receipt of signed rental agreement & payment. Contact us at 406-858-2422 for references and reviews or questions. Jul 20-Jul 26 $2,375 (Currently available) Please contact us. For 2019 Rates & Availability: check out our rates at (VRBO listing number 314751) but you can book through this site to avoid service fees. Currently July 20-July 27, 2019 checkout is available despite VRBO calendar. Please Note: Total occupancy restricted to eight persons with only registered guests allowed access to property and amenities offered. Guests must be approved in writing in advance and must sign the rental agreement and provide photo ID on or before checkin. Feel free to contact us if you have any questions or concerns so that we can make sure your expectations can be met. This ad has been viewed 1853 times. I have mixed feelings about writing this reviews. On the one hand, I'd like to keep it a secret. On the other, it deserves to be enjoyed by others. This is a GREAT place. The pictures do not do it justice. While I am not sure I would recommend it to families with small children because there is little beach area, to all others, Wow. We had the opportunity, thanks to the owners, to see the whole of the lake and the homes there. It is the BEST place on the lake. If a quiet vacation by the lake is what you are looking for, this is it. The owners, by the way, Dan and Karen Cromwell are the most gracious and accommodating hosts you could ever want. Believe me, you will not be disappointed in this rental. Would we go back? In a heartbeat!" 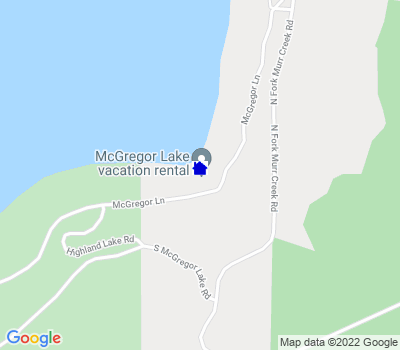 340 McGregor Ln, McGregor Lake, Marion, MT, 59925, United StatesThis place is amazing! We were pleasantly suprised at how beautiful and spacious this cabin is,the rooms are all huge and the deck is probably the biggest deck I have ever seen! The yard is beautifully landscaped and Don and Karen keep it immaculate. We spent many hours in the hot tub watching the sunsets just steps from the water. We thought the kids would be a bit dissapointed that there isn't a beach, but they spent hours jumping in the lake off the dock, snorkelling and catching crawfish. The lake is quiet, calm and crystal clear. We rarely saw more than one boat waterskiing on the entire lake. The Cromwells were always near by if we needed anything yet also gave you your space. They also graciously took us around the lake on their pontoon boat showing us the sights. We agree with another reviewer, mixed feelings about giving it an excellent review cause we want to keep this secret to ourselves! " This home is beautiful and even better than we expected! The home has 5 very large bedrooms and three full baths! This house easily accommodated us and 7 of our children. The deck is Huge and we used the hot tub everyday after skiing, wake boarding and tubing on the pristine Lake McGregor. The lake was so clear and often very glassy. We brought our ski boat and launched it right in front of the house - there is a private launch ramp and private dock. Most of the time we were the only boat on the lake. We visited Glacier National Park - only an 1 hour and 10 minutes away. It was an easy day trip - back in time to ski that evening The kids caught crayfish and we had a crayfish broil - tasted like lobster! We built fires in the fire pit at night and made s'mores. The owners are very nice and helpful. Our stay was very comfortable. The full kitchen made it nice to cook. We plan on coming back next year!" What a little piece of heaven on earth is this place! Serendipitously we were able to find this gorgeous house on the lake for our vacation in Montana. The owners, Karen & Don Cromwell were the best. They made sure we had everything we needed to make our stay great (even some mosquito spray). We enjoyed all the pluses of their place: Immaculate house, expansive deck with great sunsets to watch over the clear lake, in deck spa, full kitchen, comfortable beds, quiet solitude and fresh air. They shared a ride on their pontoon for the two of us and even made a fabulous steak dinner to help celebrate a 55th birthday. What is rating for this vacation rental? It is a definite 5 star, Triple AAA accommodation. Move over the Ritz-Carlton – McGregor Lake Vacation Rental has you beat! Recommended for: Girls Getaway, Age 55+, Romantic Getaway, Fami"
We loved the house and our time away with our family! Extremely well-stocked and much more than we had expected. The kids each had their own room and we all shared the three full bathrooms. We used the hot tub day and night especially when the weather was cool. Loved being right on the lake and even had a big crayfish feed caught right below our own dock. Very gracious and generous hosts! We would highly recommend this private and relaxing retreat! Recommended for: Families with Young Children, Girls Getaway, Age 55+, Romantic Getaway, Families with Teenagers. From the gorgeous scenery to the gracious hosts, this was the perfect vacation getaway. The house has a lot of nice personal touches, and Don and Karen were very considerate of our privacy as well as our needs. The house is truly phenomenal, the views stunning, and the fish pleasantly elusive. We would certainly recommend this to anyone. The location is far enough from a large town to be secluded, but close enough to allow use of the services. It is also very easy to find, even without GPS. We will certainly be going back. Recommended for: Pet-friendly, Girls Getaway, Age 55+, Romantic Getaway. This vacation home belongs on the cover of a magazine.It's a perfect setting on a crystal clear lake with serene mountain views.The home and property are meticulously cared for and feel more like home than a rental property.Karen & Don ensure all the little things are taken care of so all you have to do is unpack and relax. The amenities are many and we appreciated all the personal touches that make the stay one to remember. It's located close enough to Kalispell to be convenient, yet far enough to be able to enjoy nature at its best.I highly recommend this property- must be one of the best on VRBO ! "The pictures don't do this place justice! Not only were the accomodations amazing but Don and Karen went out of their way to make sure everything was just perfect. One day we were having a little family reunion and we were trying to start a fire (it rained the entire two weeks so the wood was wet) and after about 10 minutes of struggling we saw Don coming down the driveway on his 4wheeler with dry wood. It's those little things that made the experience wonderful and would make me definately stay here again! Recommended for: Families with Young Children, Pet-friendly, Sightseeing, Girls Getaway, Age 55+, Romantic Getaway, Families with Teenagers. My wife & I decided to take our kids and their significant "others" on our Montana adventure. This was truly an experiment in human interaction! The McGregor Lake home was the perfect location with the perfect accommodations. When we weren't busy exploring Kalispell, Whitefish or Glacier National Park, our days were filled with fishing, boating, crayfish hunting and relaxation. The owners were gracious hosts and even provided us (and our dogs!) a personalized tour of McGregor Lake on their pontoon boat. We have stayed at over a dozen VRBO properties and this ranks right up there with the absolute best. Thanks! Recommended for: Pet-friendly, Sightseeing, Girls Getaway, Adventure Seekers, Age 55+, Families with Teenagers. Beautiful spot that pictures do not do justice to. Everything is as described.....perfect spot for a couple or a family - the deck is positively amazing. Great spot for hot tubbing, sunset watching or just relaxing. Don and Karen are the ultimate hosts and keep the property immaculate. They are close by if needed but respect your privacy. You truly need not bring anything but your toothbrush and clothes; everything is provided - even things you don't think about!! Don and Karen are both very sociable and knowledgeable of the area for fishing tips as well as local eating spots if you wish to eat out. We certainly hope to come back.......our 2 dogs also enjoyed their stay - the deck is great for them to safely relax on and the boat ramp allowed our terrier to do a little swimming. Lots of grassy area for kids or pets to play. Problem was that we only booked 1 week"
Like other reviewers, I almost don't want to tell you how fantastic it was to stay on McGregor Lake. We loved staying here, a true family vacation in the most perfect of settings. The location is magnificent, right on the lake, but a short drive into Kalispell has every store you could possibly need. Karen and Don are the most gracious and welcoming of hosts. You get all the privacy you need to enjoy their vacation home with little interruption, but they are always there if you need anything. The cabin has everything and the views are spectacular, easily the best vacation home we have stayed in! Lots for everyone to do, we caught plenty of cray fish, went out onto the lake most days and enjoyed the perfect peace and quiet of life on the lake. Very clean and comfortable, a real home away from home. I would highly recommend this property. The perfect holiday getaway with the perfect hosts. We'll be booking again "
Our 2 families recently enjoyed Karen and Don's hospitality for a week in July 2011. The pictures of the property dont do it justice. The hot tub is newer and well maintained, which is hard to find in Montana! The yard is beautiful, and the lake is gorgeous! The water is crystal clear. The mosquitoes were present, but Karen supplied everything we needed to keep them at bay. The property could easily be priced much higher, it is by far the best value in northwest Montana. Recommended for: Families with Young Children, Pet-friendly, Girls Getaway, Adventure Seekers, Families with Teenagers. Future Renters: We are pleased to announce that we have recently screened in one side of the lower level lake front porch to accommodate outside entertaining/dining (with a lake view) during those times when mosquito's are present. Second level bedroom porch screened." From grand parents to parents to grand kids all agreed this was the best family vacation. Perfect setting, house, accomodations and owners. Don't worry about what you forgot at home, Karen and Don are great hosts and have anticipated your needs for a 5 star vacation. They meticulously maintain their property and go out of their way to make sure you have a quality stay. There are excellent day excursions close by to Flathead Lake, Whitefish and Glacier Peak National Park. If you just want to stay put there is great fishing, boating or your can just sit on the huge deck and enjoy the beautiful scenery. Qur stay was in August and it is now November and just thinking back to our stay gives me a warm feeling. Looking back at this vacation the only down side is that it was to short and the wait to return will be too long. Thank you Karen and Don "
"Not sure I want to share. We had the most awesome and relaxing family reunion. Karen & Don were very gracious hosts when hot water went out for a few days. Beautiful lake, grounds, weather, what more could you ask for? All the amenities of being in your own home and then some Not sure I want everyone to know about this place as it might be more difficult to get it for our next reunion. Thanks again to Karen & Don for knowing how to take care of us in the best fashion. Recommended for: Families with Young Children, Pet-friendly, Sightseeing, Girls Getaway, Tourists without a Car, Adventure Seekers, Age 55+, Romantic Getaway, Families with Teenagers. Just returned from another enjoyable week at our favourite lakeside vacation spot. This vacation home lends itself to a multitude of activities, whether its fishing at all the nearby lakes, going ATVing on the nearby mountain trails or just kicking back and enjoying the warmth of the home. Karen & Don are fantastic hosts who go the extra mile to ensure your stay is a memorable one. We all enjoyed the pontoon tour and the nearby scenic trails. Will we be back ? You bet we will - see you next year ! Recommended for: People with Disabilities, Families with Young Children, Pet-friendly, Sightseeing, Girls Getaway, Adventure Seekers, Age 55+, Romantic Getaway, Families with Teenagers. We had never been to Montana before, and can't wait to return. And actually, the photos do not "accurately reflect the rental's appearance and amenities," because the house and location are even more spectacular than they appear in the photos! The lake is heavenly, the deck and hot tub are indescribably wonderful, and Karen and Don are fun and interesting hosts -- thank you for that pontoon ride! -- the kind of people you will want to keep in touch with after your stay is over. The house is immaculate, and absolutely everything you need is here. Oh, and did I mention the home-made brownies, banana nut cake AND bottle of wine waiting for you when you arrive? My only regret is we had to leave!! Thank you both for a truly blissful week. Recommended for: Families with Young Children, Sightseeing, Girls Getaway, Adventure Seekers, Age 55+, Romant"
WOW!! They've really thought of everything and have created a place for carefree rest and relaxation. The house is spacious, clean and well equiped. The pictures on the site don't do justice to how beautiful the area and the estate are. Don & Karen were gracious hosts and even took us for a boat ride of the lake. It was all the little things that made the experience wonderful and we would definately recommend the place to my closest friends and family. As others have said in their reviews: "Not sure I want everyone to know about this place, as it might be more difficult to get in the future..."
Recommended for: People with Disabilities, Families with Young Children, Sightseeing, Age 55+, Romantic Getaway, Families with Teenagers. Beautiful setting that can't be beat. Everything that you need is provided. Home is very inviting and the deck is a perfect place to relax and enjoy the scenery. Close to many hiking trails and Glacier National Park is about an hour away. Recommended for: Families with Young Children, Pet-friendly, Sightseeing, Girls Getaway, Adventure Seekers, Families with Teenagers. What a wonderful vacation spot! The cabin was fully equipped with kitchen accessories, beds were super comfortable, and the view was spectacular! Would not hesitate to book here again! Recommended for: Families with Young Children, Pet-friendly, Girls Getaway, Age 55+, Romantic Getaway, Families with Teenagers. My husband, myself and my 3 teenagers had the pleasure of staying 2 wonderful weeks on Lake McGregor at this magnificent home. Right from the start we were greeted and well taken care of by our gracious hosts. We were overwhelmed by the natural beauty that surrouned us right off the back deck of this beautiful home. It was beautiful inside and out!! We spent a lot of time venturing out to see the host of things Montana has to offer. However, we spent equal time at the property, soaking up the sun on the dock, catching crawdads, canoeing around the lake, enjoying family time around the firepit and bbq outside. Sitting on that beautiful back deck both morning and night provided such awesome panoramic view you did not want to move. Did I mention the great hottub on the deck too?! The home and the gracious owners surpassed what I thought I was in for. We made many unforgettable memories!" Our week at Lake McGregor was better than imagined. Our two families with 5 small children(under5) had a ton of fun playing with all the extras (canoe, rowboat, kayaks, pond, pool, hottub, crawfish traps, treed area, firepit etc etc.) The house has ample space and everything you need to have fun and rest and relax. The owners took great care of us. The views from the deck were amazing, I'd love to wake up to that every morning. We had such a good time, we booked another stay immediately after we left. Can't get a better in Western Montana (and probably elsewhere too)! Recommended for: Families with Young Children, Age 55+, Families with Teenagers. Our family had the perfect vacation at Karen and Don's lake property. The house has everything you need to make your stay an enjoyable experience, from dishes,cookware,glasses,flashlights,jackets,and even bait for catching craw fish. We had plans for activities in the surrounding towns for three of the days we were staying at the property. We went to Glacier Park one of the days and when I discussed the next days plans everyone including our 21 and 22 year old sons said they would rather stay at the lake house. We stayed for a week and had plenty to do at the house for six of us- The pics do not accurately relay the beauty of the property, lake, or the house. I would suggest this vacation rental to anyone and everyone. We never go on vacation at the same place twice as to see our beautiful country, but I may have to break our own rules for this place. You can not go wrong with this vacation property. None of us with forget! Rented this home for my parents for one week in September. Pictures do not do it justice. Lovely house, lovely setting. The property owners were very pleasant and welcoming. We all had a wonderful, relaxing time. Recommended for: People with Disabilities, Families with Young Children, Girls Getaway, Age 55+, Romantic Getaway, Families with Teenagers. What a wonderful week we spent at Don and Karen's beautiful home. My husband and I had a week of peace, relaxation, long walks and some serious reading. This home has everything you could ever need or want. There are screened-in decks and and a complete enclosed and covered main deck perfect for small children. We have already booked another week with our grandson and adult kids in the summer. Kalispell is an easy drive with great shopping plus a lovely rustic diner just down the road from Don and Karen's that serves a great fish and chips. Don and Karen are gracious, warm and make your stay so enjoyable - I'm sure, like us, you will not want to leave. This home is spotless, completely equipped and charming. Just pick up a few groceries and settle in for the most relaxing time. We would recommend this particular property to everyone - Just don't book it when we do - we will be back "
My husband and I dreaded vacations end by day 2, as it meant leaving the property. Our sentences usually started with "look how gorgeous". The surroundings are beautiful, Karen & Don are wonderful people and the house is too good to describe. The details and thought put into making the house comfortable truly shows. The lake is clear. I recommend taking one of the boats out for an early morning ride. There is plenty to do in the surrounding areas. We visited Glacier National Park, Flathead Lake and drove to Canada. Just enjoyed the hot tub and lake.It snowed one day, covering the trees in nearby hills and made a gorgeous view outside the kitchen/dining room windows. All the people we met were friendly. This is the perfect spot to bring someone you are thinking about marrying. If they don't like the property you know they will never be pleased so.....RUN.You will not regret booking a stay at this property." This is the 3rd year we have returned to this fantastic property and there is a good reason for it ! Don & Karen are wonderful hosts and always ensure the property is in top notch condition, hard to believe, but it keeps improving every year. This year we discovered 2 kayaks for our enjoyment, new big screen TV's and even nicer landscaping than before. The built in hot tub on the deck is enticing and where else can you find a lake front view so picturesque ? Always lots to see and do at nearby recreational areas, perfect for ATV's too. Just unpack and relax............it's like coming home ! Highly recommended ! Recommended for: Families with Young Children, Pet-friendly, Sightseeing, Girls Getaway, Adventure Seekers, Age 55+, Romantic Getaway, Families with Teenagers. My husband and I visited Montana for the first time and will definitely go back. The cabin was beautiful and huge. Everything we needed was there. We stopped at Costco for some food and drinks and were set for the week. The place sleeps so many, we've discussed going back with the extended family. There's so much you can do while there, or if you choose to relax, you can do that too. Whether you are a child, retired or an adventure seeker, there is something for everyone. Don and Karen were great hosts. When we arrived, they had a bottle of wine and homemade banana nut bread waiting for us - not only was it a nice touch....it was delicious. When they found out we were there for my husbands 50th birthday, they invited us over for dinner and made a cake to help us celebrate. They really made our stay and his birthday memorable. Our family of four (kids aged 7 and 4) rented this property for 2 weeks at the end of June and absolutely loved it. While the weather was not the best, we had a great time playing on the property, using the canoes and kayaks, and using the hot tub. Don and Karen are wonderful hosts from taking us on a boat trip around the lake, bringing us baked goodies and even offering to pick things up in town as needed. I asked my 7 year old for her input and here are her comments: - very clear water (although a little too cold in June for jumping in). - the house has everything you might need (like flashlights and first aid kits) - Don and Karen pay a lot of attention to their property (it is clear that they take great pride in both the house and the yard) All in all, we loved our time in Montana and are planning to return very soon. We so enjoyed our vacation at McGregor! The cabin is wonderful and so well maintained and clean. All amenities and more were provided. From the crayfish traps to the kayaks, this cabin has it all. Karen and Don are always available to help in any way and are very gracious hosts. The pictures do not fully capture the beauty of the cabin and the surroundings. The lake is so clean and clear. We cannot wait to come back! Thanks Karen and Don for sharing your piece of paradise with us! Recommended for: People with Disabilities, Families with Young Children, Pet-friendly, Adventure Seekers, Age 55+, Romantic Getaway, Families with Teenagers. We have been coming to Montana for holiday stays for 30 plus years. This is a wonderful spot. McGregor Lake is beautiful and the house was perfect for us. Nice dock for your boat and the owners were very friendly and accommodating (they live next door). Many amenities to the property: small boat, kayaks and canoe, the home fully equipped for an extended stay and well water (as opposed to lake water which many "cabins" still have). About a 40 minute drive to Kalispell or 60 to Libby. We have booked again, so yes, we recommend! Recommended for: Tourists without a Car. We just stayed for a week at this cabin and it is beautiful!! It is right on a lake and has all of the amenities you need. We enjoyed catching craw fish, kayaking, sitting in the hot tub and sitting around the fire at night. If you are trying to find a quiet relaxing place to unwind, you won't be disappointed. Karen and Don live right next door, so if anything comes up, they are right there to help out, while giving you your own space. Highly recommend this place!! Recommended for: Families with Young Children, Pet-friendly, Age 55+. Our family of four with a dog just returned from a wonderful holiday in Karen and Don's rental home. The home is incredibly well set up and situated to allow for any sort of group to enjoy their stay. Some of my favourite things to do were making lattes in the morning to enjoy on the amazing deck, cooking meals in the professional kitchen, watching crayfish on the dock with my children, kayaking with my children and most of all being able to simply park our vehicle for a week and truly get away from it all. You won't find nicer more hospitable hosts either - they made the stay truly fabulous. I know I'll be back.....as long as there's an availability! Recommended for: People with Disabilities, Families with Young Children, Pet-friendly, Sightseeing, Girls Getaway, Age 55+, Romantic Getaway, Families with Teenagers. We have been VRBO'ing with our dog for eight years staying at 30+ properties. We can say with certainty that Karen & Don's rental home is one of our top five! We visited again this year (only one of two properties that we returned to) to find this property even better than in 2011! Always very welcoming hosts being available at a moments notice but not hovering over us. The banana nut bread ,home baked by Karen, was a special treat this time & their offer of a boat ride around the lake especially sweet! This is an awesome lakefront property that is meticulously managed by Karen & Don. Words can't describe the beauty of the lake & huge deck that surround this property. Even though it took us two years to get back it felt like our friendship was just like in 2011. Everything this property advertises is true with so much to do! We had a great time! Thanks to Karen & Don! "PARADISE-What a wonderful home! I don't really have the words to express what a wonderful, clean, gorgeous place this was. The home was inviting and very clean. The view was spectacular. It was raining and cloudy most of the time we was there, but it was still so relaxing. To sit in the hot tub during the rainy nights was just wonderful. Don and Karen are two very wonderful, friendly and gracious owners. Can not thank them enough. The grounds are just as gorgeous as the home! Anything you could possibly need for cooking is there. We experienced a crawfish boil, which was a first and very fun and interesting. My son got to kayak for the first time and he loved it (one Christmas present down)! Karen said the pictures does not do the property justice and she is right. The huge wrap around deck, the view from this deck is awesome. My dad (almost 86 yrs old) every day would comment on how beautiful the home and the view was. I pray that we will be able to return"
With the beautiful lakefront our girls weekend was the essence of relaxation. Lots of room to do your own thing or have a group dinner, great kitchen amenities and Karen has a few staples in case you forgot to buy something. We even caught crayfish off the dock and had enough for dinner. The monster covered deck was a huge plus to enjoy the fall weather and have a soak in the tub! About 40min drive out of Kalispell and worth the drive. Can't wait to see it in the summer next August! Recommended for: Families with Young Children, Sightseeing, Girls Getaway, Adventure Seekers, Age 55+, Romantic Getaway, Families with Teenagers. "4th year at our favorite lakeside retreat ! Don and Karen's hospitality keep us coming back. Wonderful hosts that go the extra mile to ensure the vacation is enjoyable. Property is always immaculate, spacious surroundings and a modern home with all the amenities that make our stay comfortable. I have stayed at many vacation homes around the globe - but this one stands out as our favorite. Lots to do in and around the area, we discover new adventures on every visit. Both Montana and this vacation home leave you breathless. "second visit better than the first. Our family of 5 didn't know what to expect when we booked our vacation in Montana. But when we arrived to our cabin on a lake with the best view you could ask for, we where more than pleased. Karen and Don could have not been more welcoming and friendly. The cabin is everything they stated and MORE!! Enjoyed late rides in the kayak with the crystal clear water watching the sun set on the lake. Campfires, catching crawfish, hot tub soaking or just relaxing in the cabin watching t.v. it was all wonderful! I would definitely stay again if we get a chance to get back to Montana. Thanks Karen and Don for all the memories we made at your cabin! and the treats of course. This was our family's second year visiting McGregor Lake, and like last year, we were not disappointed. Once again, Don and Karen were fantastic hosts and are able to strike a great balance between being present when needed, yet giving personal space to our family - we really enjoyed the multiple rides around the lake on the pontoon boat. Our two kids, aged 5 and 8, had a great time swimming and kayaking, making s'mores at the campfire and catching crayfish in the lake. The adults thoroughly enjoyed evenings on the deck watching the sunset. All in all, we had a fantastic vacation. At the end of two weeks, we were all wanting more and are already looking forward to another stay. Recommended for: People with Disabilities, Families with Young Children, Sightseeing, Girls Getaway, Age 55+, Romantic Getaway, Families with Teenagers. Didn't think it could get any better than our first rental but it did! Don and Karen have made several upgrades (not that it needed them) in the past 4 years and will obviously continue to keep their property updated. This is by far the nicest rental property we have ever rented....I'm sure we will be back again. Karen & Don, Thank you doesn't even seem adequate for the week we spent at your gorgeous cabin! This was just what our family needed after the loss of my stepfather - and it was such a relaxing week for our whole family. Your house was amazing an we loved spending time on the lake and watching sunsets on the deck! We hope we will be able to come stay again in the future. You and Don are fantastic hosts and the kids loved the pontoon ride around the lake! Thank you again for everything it was an incredible week! Hope we can be back in the future!! My family and I had a wonderful stay at your McGregor Lake Guest Ranch! Each summer we rent a home for a week and this was by far the cleanest and best supplied home! Hope to return another summer! Thank you for making our stay so comfortable and special! "Beautiful Home on McGregor Lake! We recently spent 7 days at the house on McGregor Lake with our family. It was such a beautiful house! The kids spent hours a day snorkeling in the clear blue/green water. We enjoyed being able to use the paddle boat, water toys and life vests for everyone. The house is fully stocked with all the comforts of home, and Karen and Don went above and beyond to make sure we were comfortable; they even took us for a boat ride around the lake! I have zero complaints about our experience with the lake house or the owners. In fact, the kids have been asking when we get to go back. I recommend this vacation home and hope to go back again as well. Thanks for everything, Cromwells! Recommended for: Families with Young Children, Pet-friendly, Sightseeing, Adventure Seekers, Age 55+, Families with Teenagers. This is our fourth year coming here and we love it! It has everything you need for a lake vacation. The boats and kayaks are so fun, there are plenty of life jackets for kids and adults, and the house has everything you need, even for a most delish crawdad boil (traps and all). And the owners are awesome! Thank you for providing an excellent experience every year. Recommended for: People with Disabilities, Families with Young Children, Girls Getaway, Age 55+, Families with Teenagers. We just returned from yet another wonderful trip to Montana. Don and Karen continue to be absolutely wonderful hosts. Our children adore them too and can't wait to see them each summer at the lake. The house itself continues to have absolutely everything we need and each year there are small upgrades done around the house making it even better. Although the weather wasn't perfect, even on windy days our kids loved swimming in the waves and jumping off the dock. There are more than enough kayaks and tubes to play around with and we loved the addition of the paddle boat this year. There are always enough life jackets for kids and adults. We highly recommend this as a great place to come and relax and enjoy time together as a family. Our kids' favorites: Canoeing, kayaking, tubing, swimming, hot tub, jumping off the dock, camp fires, catching crawfish, and "